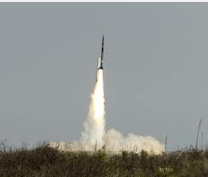 Spaceport America officials announced that they successfully launched the 10th rocket from the launch site 35 miles southeast of Truth or Consequences / Elephant Butte on April 6, 2012 at approximately 8:18am. The rocket reached an altitude of 73 miles or 385,640 feet – a new Spaceport America altitude record. The primary payloads were reportedly Department of Defense experiments. Additional payloads were carried for the Federal Aviation Administration, the University of Texas and the National Aeronautics and Space Administration.